Those of you who subscribe to the Times Union newspaper, may have picked up a reference to the blog and me in the business section today (1/26/12). If you do not subscribe, it is a good enough reason to go buy a damn paper. 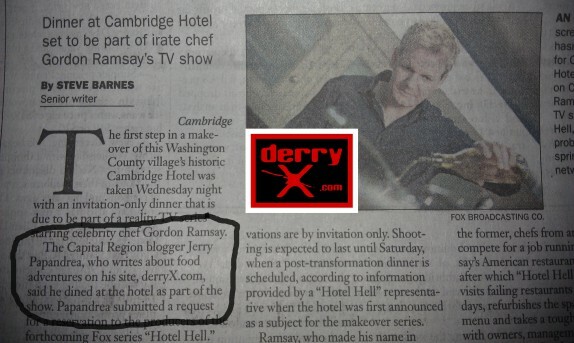 Those of you who are not familiar, a few weeks ago, Steve Barnes posted some information regarding the taping of Gordon Ramsay’s new show, Hotel Hell, to his Table Hopping blog. I emailed the producers, and made it onto the reservation list for the first night of taping, which was last night. Because of a non-disclosure statement I signed, I am not going to blog about anything pertaining to the taping of the show, but I do plan on a derryX Dines treatment in the near future. Not giving too much away, completely separate from the fact that there were cameras everywhere, the night was absolutely surreal. So, anyway, pick up the paper, and read Steve’s write-up. If you are not a paper person, read a version of it here. Holy F, that is seriously awesome.